Who can you trust? Betrayed by his brother and his childhood love, Brice Kinross needs a fresh start. So he welcomes the opportunity to leave Sweden for the Scottish Highlands to take over the family estate. But there's trouble afoot at Rosyth in 1754 and Brice finds himself unwelcome. The estate's in ruin and money is disappearing. He discovers an ally in Marsaili Buchanan, the beautiful redheaded housekeeper, but can he trust her? Marsaili is determined to build a good life. She works hard at being a housekeeper and harder still at avoiding men who want to take advantage of her. But she's irresistibly drawn to the new clan chief, even though he's made it plain he doesn't want to be shackled to anyone. And the young laird has more than romance on his mind. His investigations are stirring up an enemy. Someone who will stop at nothing to get what he wants - including Marsaili - even if that means destroying Brice's life forever ...Sequel to Trade Winds. Trade Winds was short listed for the Romantic Novelists' Association's Pure Passion Award for Best Historical Fiction 2011. Like Diana Gabaldon, Courtenay brings the Highlands, following the Battle of Culloden, to life. Readers will almost smell the heather and feel Brice's emotional pain, and they will be swept up by the atmosphere and held captive by the quick pace and tense moments. Courtenay's gift for untangling threads, so that good will triumph, is what makes this a winner. 4 1/2 stars! Shortlisted for Historical Romantic Novel by the Romantic Novelists' Association's Awards 2012 Author Courtenay s investment in Highland history pays off big time. Brice s reclaiming Rosyth as its laird, especially as he is a stranger and potential adversary to the clansmen, illuminates a dark and struggling period in Scottish history, as well as provides evidence for the emotions and reaction Brice s return elicits. Good historical romances allow readers to romp around and experience bygone days, allow you to sympathize and relate to the characters via past events and often gives a budding relationship that extra oomph of tension. Great historical fiction builds on all of those things while grounding each and every character s motivations in the long past events. 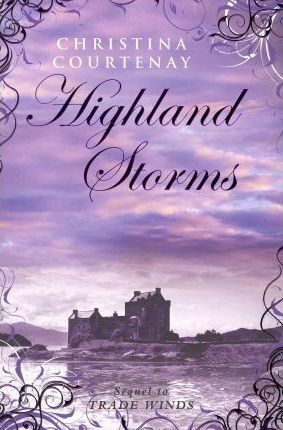 For the record, Courtenay s Highland Storms is a great historical romance." A fabulous setting - Scotland - coupled with some vivid characters that provide romance and heartache in equal measure. As with many of the books published by Choc Lit, this one is a real treat." This sequel to "Trade Winds" is passionate and engaging, with some amazingly evocative descriptions of the rugged Highlands. A great winterread." Set in 1754, "Highland Storms is the sequel to "Trade Winds." While not awash with historical detail, the plot of the story itself, along with descriptions of the people and surrounding countryside, are captivating. Add treachery and romance to the mix, and you find yourself with a well written, fast-paced, enjoyable read.